Hugh and I have just returned from nine weeks in Spain spent lizard catching, lizard processing, running lizard experiments, releasing lizards back to their homes and explaining to locals in terrible Catalan and Spanish that we were not collecting lizards to eat. We had an absolute blast. 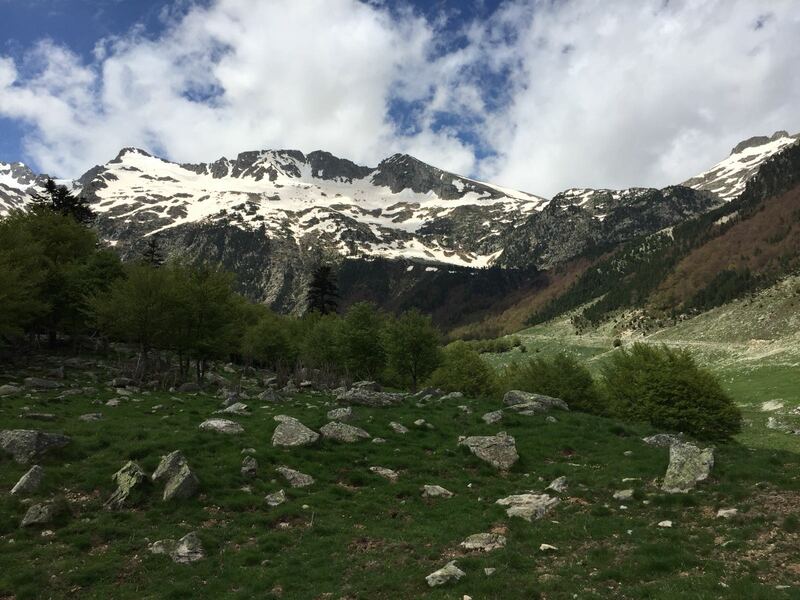 The Pyrenees were amazingly beautiful. We haven’t many mountain ranges in Australia, so this was something very special for me. We had wonderful hosts at the University of Barcelona field station, near Vielha, and on the weekends in a small nearby village, Vilaller. It took the full 9 weeks to be able to pronounce these names correctly. In contrast it took about 30 seconds for me to become a crazy mountain road driver and to fall in love with Catalan cuisine. The Podarcis were plentiful, and I came to be very fond of them. As I mentioned in a previous post, Podarcis muralis are colour polymorphic – which means that even though they are all the same species, and the same population, male P. muralis may be one of three different colours (called morphs). The persistence of multiple morphs within a population is seemingly contrary to evolutionary theory, where only the ‘fittest’ trait should survive. Understanding the factors allowing multiple morphs to persist is a perplexing, but promising, avenue of evolutionary research. Recent work by my PhD supervisor Devi Stuart-Fox has shown that the existence of colour polymorphism in a group may accelerate speciation. So, studying colour polymorphism is like studying evolution in action! The research I’m undertaking here is designed to assess how environmental factors (such as altitude and average rainfall) and social factors (such as the ratio of males to females in a population) may influence which morphs are present in the populations and the proportions of each morph. I was also able to conduct some behavioural experiments aimed at determining whether the morphs differ in their boldness and exploration of new areas. Both avenues of inquiry may shed some light on how the different morphs are maintained within the populations. Despite some inclement weather in the first three or so weeks (not ideal for lizards), we were able to increase our working pace towards the end and reach our goal of 10 lizard populations with a full week remaining. So, we went ahead and collected two more populations – bringing the total number of lizards to over 1000. In fact, on one of the last populations we managed to catch a full population of over 80 lizards in a single day – and Hugh even had time to play photographer for a lizarding photoshoot! lizards lounging in the sun. I pull off their tails. N.B. I did pull off some lizard tails, which was an unpleasant but necessary part of the data collection process. We only collect a tiny segment from the end of the tail, and we use this for genetic analysis which is a critical part of the project. The lizards grow their tails back quite quickly.